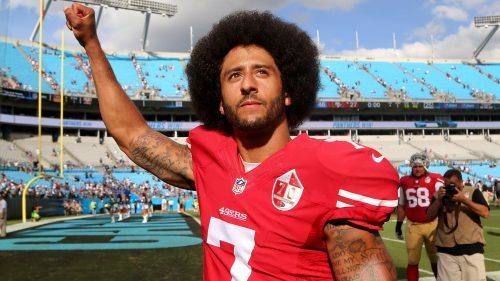 A few months ago, I stated outright that Colin Kaepernick would never play for another NFL team and that prediction has already been fulfilled. What needs more clarification is the second part of the prediction where I said that he would reveal dark scandals in the league that ultimately lead to its downfall. The recently filed collusion lawsuit against the NFL ends his pursuit of a quarterback gig, though it was obvious that he was already blackballed this year. However, the NFL will find in short order that they made a mistake in blackballing him and what comes out will cost them more than having signed him to a contract to play once again. The media has already been attempting to downplay the enormity of his filed grievances by dismissing his chances of winning. That is what corporate power does at first when someone dares to openly challenge the system. While it may seem that his odds are long, and the employment of questionable lawyer Mark Geragos doesn’t help his case, his courage will inspire those inside and outside the league and the deep state to come forward with damning information to help his case. This information will end the collective bargaining agreement, inspire a player strike next year, see further ratings decline and set the league up for a self infliced downfall. Through the process of discovery, Kaepernick’s team will expose corruption in the ranks of the NFL owners and trouble follows suit. His work will expose the plight of cheerleaders as they fend off Harvey Weinstein like sexual assault and inhumane working conditions. He’ll shine a brighter light on the NFL’s refusal to allow a man with the only complete copy of the first super bowl from making a profit on his prized possession. Kaepernick will also show ties between the NFL and the Trump administration that will create fury and lead to federal charges against many team owners. All of this in combination will contribute to a significant decline that will destroy professional sports forever. Though it is sad that Kaepernick made the sacrifice that he did, it will not be in vain. Though I do fear for his life as he continues on this journey, he will have done more harm than good to the owners of the league where they will live to regret their decision to shun him for political purposes. The decline of football is coming on the heels of Kaepernick’s exile. He will be remembered as one of history’s great social activists while the sport will be remembered as a modern day gladiator spectacle of violence and corruption. It may not appear that way at this present time, but it will be obvious as time goes on. Football as we know it is coming to an end. Kaepernick will be largely responsible for this being the case. As I’ve written in previous posts, I don’t have a lot of visions left for this year as I don’t believe any major events will happen between now and December. Having said that, I’ll post this…. 1) There will be news on yet another country wanting to leave the EU in the near future. It’s not one I’ve already mentioned, it’s not Germany or France and it’s not a place people would initially expect at first. It seems to be more centrally located in Europe, perhaps a former Russian territory. 10/3 ETA: Although I spoke too soon in saying that there would be no major events between now and December (with the recent shooting in Las Vegas), I did say in my 2017 predictions that this year would have the most mass shootings in history. Since these have become so common in the US, it’s almost not considered a major event as it leaves the headlines not even a day after it occurs. Though it had the highest total count in modern history, it is far from the biggest mass shooting. Just ask the Native Americans. With that being said, here’s another prediction to share with you all. 2) Within the next few years, scientists will discover a star that will be the key to intergalactic travel in the distant future. Although the scientific theory behind it will come soon after, its application won’t be in place for centuries afterwards. Scientific innovations need to take place beforehand and, if war does come on the horizon, such progress might be blunted for many more years to come. While this isn’t something that comes in our collective lifetime, the discoveries for it come for the benefit of future generations. 10/8 ETA: My third and fourth predictions are more of an expansion of ones from the 2017 psychic predictions, but the fifth one is new. 3) Although I had said 10 million people would be deported this year, I have to revise that target to say it will happen by the end of Trump’s term. While deportations have actually gone down, arrests have gone up. The mass arrests are creating a situation where many undocumented people will eventually be deported, but due to bureaucracy, it won’t be specifically fulfilled for at least two more years. Still, the fact that up to 10 million may be arrested by years end is close enough to fulfillment from my perspective. 4) In addition, as I said immigration reform wouldn’t happen for at least four more years, any chance of a bill being passed to give a pathway for citizenship from Dreamers (undocumented children who came as minors) will die before it can come up for the votes. Of the undocumented who remain after four years of Trump, about two thirds will be from the Dreamer program. This means that only about half of the Dreamers will be able to stay in the country and the other half will be deported within the next two years. Sad as it is to say, the dream will die for many dreamers in the coming years. 5) I also see a permanent expiration for the Children Health Insurance Program (or CHIP) as congress won’t be able to get the votes to keep the program running this year. Many states will gut the program all together while others will merge it into either their state medicaid or soon to be passed single payer programs that will protect the children in these situations. Such inequity across the country will be one of the primary motivating factors in the passage of a nationwide single payer program at the start of the next decade. 10/21 ETA: One thought on the weather. 6) This fall will get to be pretty cold as we head into November. However, the winter will be warmer than usual with less snowfall than last year. Most of the major storms will occur in January around the second to third week of the month. 10/25 ETA: Two more predictions. 7) I had a dream last night where I was in Japan and I saw that cereal and other food prices were massively increased while local items decreased. Cereal cost $10 while handmade rolls cost 55 cents. This indicates that inflation is approaching and that prices of many goods will increase dramatically. However, locally grown products will decrease in price and become affordable. This could apply to Japan where the dream took place, but this could also happen in the US as well. Watch out for this soon. 8) I have a bad feeling we haven’t seen the last of Hillary Clinton’s presidential ambitions. She might be gearing up for yet another run, but either her health or potential criminal prosecution will stop her this time.